Some of the information on this page was put out on a map that was passed out by Christo volunteers at Tejon Ranch site. When I was in college, Christo put together his "Running Fence" which ran for 24 miles in Mendocino County in Northern California. Being a teenager at the time, with all the time in the world on my side (what teenager doesn't have all of that time? ), I did nothing except watch T.V. reports on that particular project. To this day I kick myself for not going to see his "Running Fence." It would have been a day's drive, but what's that to a teenager? So when I heard about his Umbrella project I decided I couldn't pass this one up. An added advantage to this project was it was extremely close to where I live, only a two hour drive. The Umbrella project took five years of preparations, including securing the necessary permits and performing tests in wind tunnels to make sure they would withstand winds up to 65 mph when open and up to 110 mph when closed. He chose two sites to display his umbrellas: an area which is 60 miles north of Los Angeles along Interstate 5 south of Gorman, through the Tejon Pass until Grapevine, and Ibaraki, Japan which is 75 miles north of Tokyo around route 349 and the Sato River. 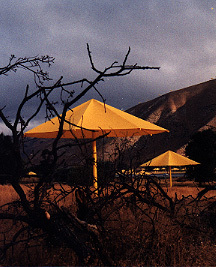 The California umbrellas were yellow in color and the Japanese umbrellas were blue in color. Both colors were chosen to represent the environment in which they were placed. I can't vouch for Japan, but the Southern Californian landscape in October is a rich yellow contrasting against the green scrub oak which is part of the natural chaparral of the region. The two regions were also chosen as a joint art project to reflect the similarities and differences in the ways of life in the two inland valleys. The 1,340 blue umbrellas in Ibaraki and the 1,760 yellow umbrellas in California were placed sometimes in clusters covering entire fields, or deployed in a line, or randomly spaced from each other, running alongside roads, villages and river banks. Eleven manufacturers prepared the various elements (fabric, aluminum, steel, and molded base cover), of the umbrellas. Christo's 26 million dollar temporary work of art was entirely financed by The Umbrellas, Joint Project for Japan and U.S.A. So how in the heck did he make any money out of this without charging admission and it being only temporary? I found out later that all of his previous projects and this one were financed in similar manners through the sale of his studies, preparatory drawings and collages, scale models, early works and original lithographs. The umbrellas were in place during October 1991 for almost three weeks. Unfortunately, his studies of the umbrellas were not quite accurate enough and on the day I was there, the wind from the storm you can see in the picture below, lifted several umbrellas up and caused one to crush a woman. Christo immediately called a halt to the project on both continents. Depending on where you were the umbrellas displayed a variety of moods. I got up at 4:00 in the morning to get up to the site at dawn. I drove all the way over Tejon Pass and down to Grapevine in the Central Valley of California and then slowly took side roads back, stopping here and there to take some pictures. I found the umbrellas most impressive when you were above them looking down. I was also especially intrigued by the 4 umbrellas that were placed in the pond. I loved the look of the reflection of the umbrellas in the water. The first thing I said to my wife when I got back home was that I wanted to go to Japan to see the blue ones, especially since a vast majority of the Japanese umbrellas were placed in a river which meandered through the valley. I am not a big art fan, but there was something about this project that struck a chord deep within me and since that time I have followed his other projects with great interest. If you were able to see the Umbrella project, I would love to hear from you. Please sign my guestbook with any comments. If you wish to use any of these images please do so, but put a link back to my main page.